This chapter describes how to store passwords via add-on. !You can only save passwords in server mode. 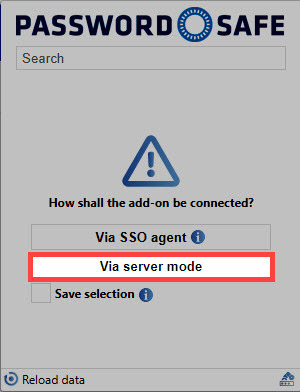 Read here how to select the server mode. With the setup and login via server mode, the access data can now be added automatically. When visiting a website whose credentials have not yet been stored in Password Safe, you get automatically asked whether they should be created. By confirming, you will be directly forwarded to the WebClient and registered there. If there are less fields in the deposited or selected form than in the login mask, the missing fields are automatically created as web form fields by default. *The right “Can manage password form fields “ must be activated, so that web form fields can be created at all. If you log in to a login screen with changed access data, you can update this automatically. To do this, log on to the login screen of the changed page as usual. Thereupon a message appears that new access data has been recognized. 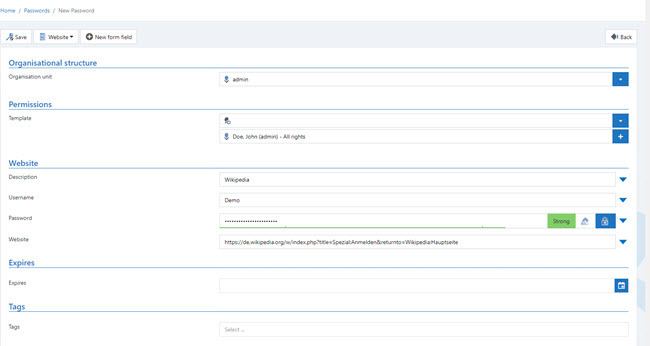 Now you can optionally decide to create a new dataset or update an already known dataset. Save password: The password will be exchanged without opening the WebClient. check changes: The WebClient is opened and you are logged in. The previous password has been replaced by the new one. However, the storage must be carried out manually. The URL must be identical. The user name must be identical. The entry must be made by the add-on and the change must only affect the password.